It's 2018, and there's been phones, tablets, phablets, laptops, laptops that try to be tablets, and tablets that try to mimic being a laptop. I know a lot of teachers, and boards are loving setting them up with those Surfaces, so I see those a lot. Personally, I haven't found much space for tablets in a while. The Pixelbook from last year was what I thought was the perfect marriage. I was eager to hear from Google what this year would have up their sleeve for a new Pixelbook. Hah, the joke's on us, they went more tablet slant than laptop. 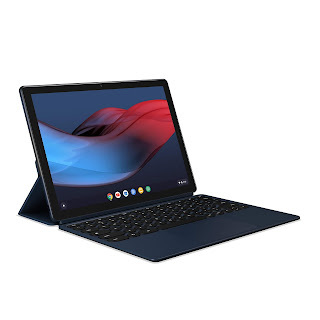 The Pixel Slate is a high-end tablet that has a keyboard 'sleeve'. Now, it's currently on a waitlist (I'm thinking probably mid-November'ish), but if you want to buy, it's going to be $850CDN for the tablet. The keyboard is $260 and the Pen is $130 (and you can get it in blue now). To get it would be $1299 ... which is what the Pixelbook was going for anyways (it's currently on sale at $1049). 12.3" @ 3000x2000 "Molecular Display"
Now, you can up the storage and processor (to an m3, i5 or i7) and the price just steadily climbs up to $1999 and higher. The neat thing I liked hearing about was how it can run full Linux. My son will love being able to play his Steam games on this. It has compatibility with the Pixelbook Pen, which is neat. It's funny how often I actually do use it with my Pixelbook actually. The keyboard 'sleeve' ... the Slate Keyboard has the magnetic connections to snap in place and hold it as well as prop it up like a stand. What I thought were a little weird was the keyboard keys. They have 'hush keys'. Essentially, round, slightly concave keys that won't go "KLACK" when you press them. At least they light up. Will be interesting to try them out. I'd always found that tablet keyboards tended to be very thin and not so... ergonomic. But I'm open minded.